Thinking about Prom? Ok there’s one thing to be said for prepping your outfit well in advance. It banishes all those dreaded “what the fuq do I wear” dilemmas and makes it far less likely anyone else will have bagged the same dress as you. From midi dresses that play by the rules to flirty minis you can wear again after the event, we’ve rounded up our fave dresses of the moment we’re calling Prom worthy. Whether you’re prepping for Prom or not, heres 5 dresses fit for a big deal event that we’re currently crushing on that you need to know about. The noughties are having a major throwback moment right now and we for one are big fans. If your prom dress code is more “out there”, opt for a Y2K inspired dress that’s simple but has all the impact. If Paris Hilton had her Prom this year she would totally be wearing this. This dress is just the right amount of demure meets just the right amount of damnnn girl. Let’s face it, when it comes to big deal events lace is always dead on. The midi length makes it grown up but glam while the choker neckline and peephole detailing gives this dress a fresh feel. Prom is your chance to go a little extra so let’s take it to the next level with a floor length gown that consists of all things extra – we’re talking ruffles, embroidery, applique and sheer bits. A prom dress this fire that won’t break your January budget? We’re sold. Introducing the versatile style you can get more splash for your cash out of by wearing over and over again. Welcome to the smart way to shop a “not so basic” basic is the babe on a budget’s go-to choice for Prom to stretch out that dollar (which let’s face it, in January is always appreciated). 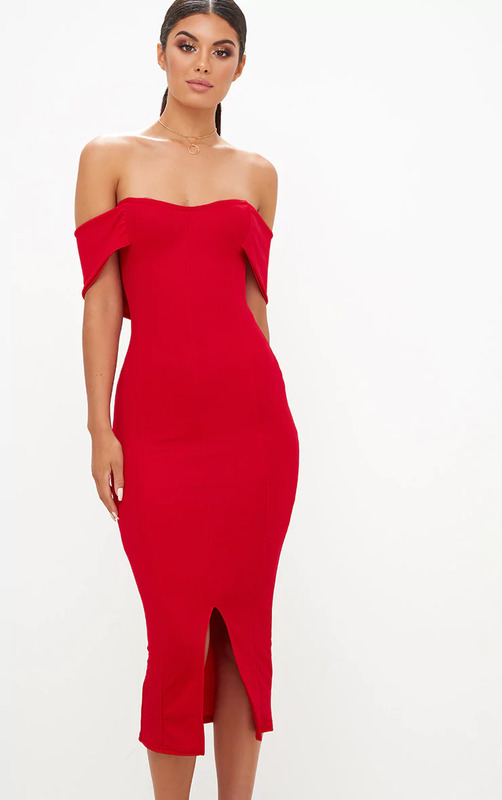 Go old school glamour and channel serious Jessica Rabbit vibes with a head to toe woah deep red number in a figure-hugging fit that calls for all eyes on you. Even if you don’t make Prom Queen this year, you and what you wore will definitely be remembered.